This is a report on a project conducted by the Manta Trust and supported with a grant from the Aquarium’s Marine Conservation Action Fund (MCAF) in 2012. MCAF supports the Aquarium’s commitment to ocean conservation by funding small-scale, high-impact projects across the globe. Since its founding in 1999, MCAF has funded more than 100 conservation projects in 36 countries and has disbursed more than $600,000 to protect highly vulnerable species and habitats and to conserve marine biodiversity. Manta rays are massive and graceful animals. With widths reaching over 20 feet from wingtip to wingtip, and weighing in at up to 2 tons, the manta is the largest of the ray species. These huge animals feed on the smallest creatures of the sea, including tiny zooplankton and very small fish. In the past decade, scientists have learned a great deal about these magnificent animals. However, much remains to be known about their intelligence, their social lives and their role in marine ecosystems. Unfortunately, these fascinating creatures are gravely threatened by overfishing due to a growing demand for their gill rakers for use in traditional Chinese medicine. Gill rakers are the tough cartilaginous structures that protect the rays’ gills and allow them to strain plankton from the water. Although purported health claims about the gill rakers are not supported by science, the market for rakers continues to grow, heavily increasing fishing pressure on mantas and their relatives, the mobula rays. These ray species grow slowly and have a low reproductive rate. Consequently, this intense level of harvesting could be devastating to their populations. Manta and mobula rays are being hunted at record levels for their gill rakers, the cartilaginous structures they use for feeding. The gill rakers are highly valued by the traditional Chinese medicine trade. The Manta Trust, an organization dedicated to the research and protection of manta rays, is studying the impact of this growing fishery on manta and mobula populations. With a grant from the Aquarium’s Marine Conservation Action Fund (MCAF), Manta Trust project leader, Daniel Fernando surveyed fish markets in Sri Lanka, a major exporter of gill rakers. The purpose of these surveys was to assess the number of manta and mobula rays caught each year, so as to better understand and highlight the vulnerability of these animals. The data collected [in the surveys] is already being used to produce a scientific publication outlining catch rate of landed species in Sri Lanka. More importantly, data from this project [was] used to support a [successful] proposal to include manta rays in Appendix II of CITES (Convention on International Trade of Endangered Species), [which will] help control and regulate the global trade of these species and improve their survival in the wild. 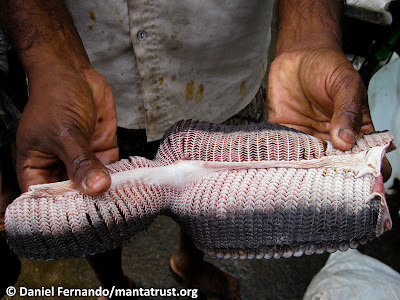 Ultimately, the Manta Trust hopes to use their research to support a ban on the export of gill rakers in Sri Lanka, which would significantly reduce the fishing pressure on these animals. In addition to their fish market surveys, the Manta Trust is working on several other fronts in Sri Lanka to protect manta rays over the long term. They are conducting ocean surveys to identify key manta habitats such as nursery grounds and aggregation areas. This data will be used to advocate for marine protected areas for these critical habitats. The Manta Trust will also work with local communities to encourage sustainable alternatives to the manta fishery, such as promoting dive tourism. With these efforts the Manta Trusts hopes to secure a brighter future for these magnificent animals. 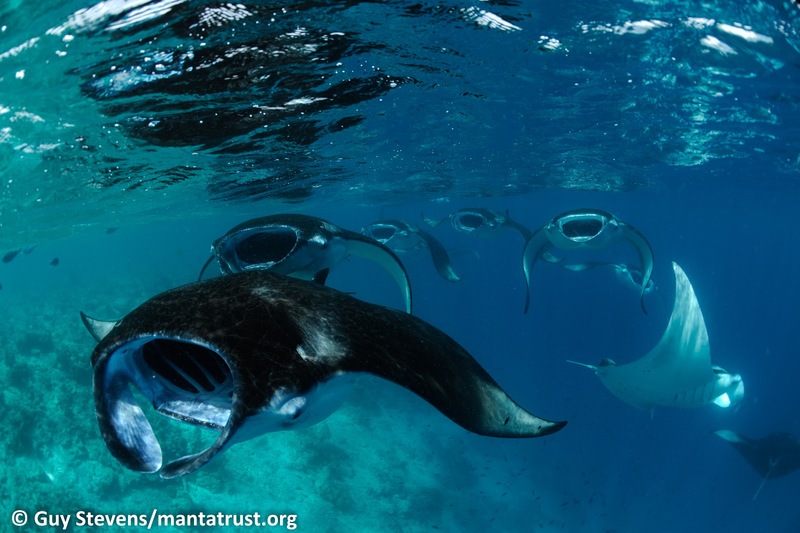 Learn more about the work of the Manta Trust on their website and Facebook page.